Posted on 06/10/2017 at 1:41 pm. For fans of heavy rock and doom, there are two words in the lexicon of all their language that has a shared, universal significance. No matter what country you are from, what your native tongue may be, those two words have such massive historical density to them that they instantly evoke reverence upong hearing them: CIRITH UNGOL. Anyone that has been around as long as I have (for the record, I am 47 years old) and has been entrenched within the underground music scene understands the legacy of this longrunning band. Taking on the name of Cirith Ungol in 1972, the four musicians that comprised the band a decade plus later, vocalist Tim Baker, guitarist Jerry Fogle (R.I.P. ), drummer Robert Garven and bassist Michael Vujea, made music history in 1984. That was the year that the quartet released their game-changing sophomore album, King Of The Dead, on Enigma Records and simply put, music would never be the same again. This landmark album went on to inspire and influence untold numbers of musicians, bands and more over the next three-plus decades. It would eventually ascend from the underground and become an iconic, audible bastion in the annals of music history. 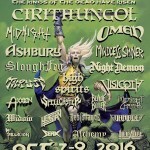 Cirith Ungol the band would share in this glorious acquisition of reverence and respect as well. They too obtained a state of high honor among those that were enlightened to what greatness this band wielded and so it came as no surprise when Metal Blade Records revealed their plans to pay homage to the band and their King Of The Dead album. Releasing the bonus-laden ‘King Of The Dead – Ultimate Edition‘ mere weeks ago to coincide with the band’s playing their first ever European show at this year’s Keep It True Festival, Metal Blade sparked something in us all. I’d already had an interview with Cirith Ungol in the works but I recognized the opportunity to capitalize on circumstances and thus we at Taste Nation LLC began brainstorming. What we came up with is, what you are in the middle of enjoying right now, the fruits of our labors to properly pay the mighty Cirith Ungol their due. You’ve seen Matthew Thomas‘ unboxing video and pictorial, you have read Ric ‘Suisyko‘ Dorr‘s review (both here) of Metal Blade Records ‘King Of The Dead – Ultimate Edition‘ and now we present you the coup de grace of today’s event. Without further ado nor hype, no more anxiety from anticipation and want, I and my fellow TNLLC teammates present to you the following: The Taste Nation LLC Interview With CIRITH UNGOL (vocalist Tim Baker, guitarist Greg Lindstrom, guitarist Jim Barraza & drummer Robert Garven)!!! Pat Riot: The origins of Cirith Ungol date back to at least 1972..what was the inspiration for starting the band? How did it first form at that time and is it true you all began playing as solely instrumental? Fans always debate the correct pronunciation of the band’s name..care to give us the official one? Tim: As the real historians of the band I will let Rob and Greg answer the first couple of questions. They remember a lot of that stuff better than I can! Greg: Rob and I met in 7th grade and instantly became friends. He and Jerry Fogle and Pat Galligan (who later joined punk band The Angry Samoans) decided to start a band to play Beatles songs, and I think the only reason they got me involved was that I had an amp. We called ourselves Titanic. Three guitars plugged into one 15 watt amp and Rob with just a snare drum and hi-hat trying to play Beatles and CCR songs. Anyway, Rob and Jerry and I wanted to play heavier stuff like Cream and Mountain, so we quit Titanic, and the three of us formed Cirith Ungol in 1972. Almost immediately we started doing some originals (“Radiation Blues”, “Flesh Dart”) along with our versions of songs by Sabbath, Budgie, Ursa Major, etc. Around 1975, Neil Beattie (aka Terry Dactyl) became our lead singer. He was a little more glam inspired than the rest of us, but he put on a really wild live show, with black widow spider fingertip extensions to go along with our six-foot wide black widow spider for “Shelob’s Lair”. Even though he was a great performer, his voice didn’t quite fit our style, and we parted ways after about a year. We spent the next couple of years writing a lot of songs and playing all the LA clubs as an instrumental power trio, playing along side bands like Quiet Riot, Y & T, and Van Halen, going over amazingly well. We tried out a number of singers, but nobody clicked until 1979, when Tim Baker, our head roadie at the time, tried singing lead on “Hype Performance”. That version is the first song on “Servants Of Chaos”. Jimmy: In 1972 I was 6 years old living on a farm in Lincoln, Illinois. I thank these guys for starting the band while I was so young, ha-ha. To be part of this reunion at 50 years old is amazing. It is rare, but I have only met a handful of people that I’ve heard pronounce the name correctly and have read the Lord Of The Rings books many times over. I still have not read the books. Maybe one day. Rob: I was inspired by Greg, because he would always turn me on to new music. I remember him showing me a copy of Mountain’s Climbing, and saying something like, “You have got to hear this!” We incessantly combed the LA area record stores mainly searching for new imported music. There we discovered Thin Lizzy, Scorpions, Lucifer’s Friend, Night Sun and many other heavy bands years before they were even on the radar in the US! There were very few that heard as much early hard rock and metal as us back then. I remember picking up Deep Purple “In Rock” at the local Sears the day they put it on the shelf! Pat Riot: What took the band almost a decade to get the debut album, ‘Frost And Fire’, recorded and released in 1980? Greg: Remember, we were only 14 years old when we started, so it took a few years and a lot of jamming to get proficient on our instruments – in my case I’m still working on it! But we wrote songs almost from the beginning, and in 1978 we actually self-released a home-recorded cassette album with a completely different set of songs than F&F. None of the songs on F&F were more than a year old when we recorded it. Some of the songs on KOTD like “Atom Smasher”, “Death Of The Sun”, and “Cirith Ungol” actually pre-date the F&F songs. Jimmy: In 1980 I was 14 years old. I had taken guitar lessons at a local music store for about a year then. I didn’t hear Frost And Fire until 1987. Rob: Like Greg mentioned we started pretty young. After the cassette demo we did, commonly known as the “Orange Demo” due to its orange cover, we were ready for something bigger. Since we never received a response from the numerous demo tapes and letters we sent out, we wanted to create a complete album of epic proportions, to show the record companies that we knew what we were doing. Pat Riot: Speaking of ‘Frost And Fire’, how do you process the fact it is such a hugely monumental, revered album now in 2017? So much there’s even a festival bearing its name, which you all played in 2016. How was that experience? Tim: For something that was never really suppose to be released as an album, it turns out to have been a great starting point! 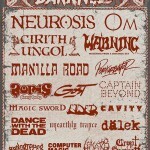 As far as playing at Frost And Fire II it was a remarkable experience! To actually get on the same stage where we had played our final concert, those long years ago was incredible. Of course the best part was seeing and getting to meet so many people from around the world that came to the Festival – a truly awesome and inspiring thing. Greg: I think because of Tim’s voice, our quirky playing style, and our inexperience in a real studio, F&F doesn’t really sound like anything else, not even any other CU album. I can hear a bit of Rush and Y&T in there, but for better or worse, it’s pretty unique. Jimmy: I have to mention that the song “Frost And Fire” is one of my favorites to play live. The experience playing live for the first time in 25 years was so amazing. Although there was a little bit of stressful moments just prior to going on stage due to technical issues (faulty tuner) that could have been unnerving had it not been detected. But, it was promptly remedied. We were 100% ready and played with really minimal issues. It was a success and we also learned a few things in the process. Rob: We had a great time recording it, and I knew the material was good, and pleased with the result. I love Tim’s voice on that album, it reminds me of a razor blade, thrashing its way through the songs. We had a private tour of the DW drum factory before they built me the greatest sounding custom oak drum set in the world, and I asked the gentleman giving the tour if he had ever heard of our band. I was shocked when he said, “Of course, who didn’t have “Frost & Fire” growing up! As for the Frost & Fire Festival II, it was an awesome experience, playing in our hometown in front of a packed audience from around the world! The next day during the meet and greet there were people who came from as far away as China & Russia just to see the band! 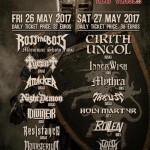 Pat Riot: I understand Cirith Ungol are playing more festivals this year such as Days Of Darkness and Psycho Las Vegas..What is your take-away from seeing the band hold such a spot of reverence with music fans now? Would or will the band undertake any full-on touring plans in the future? Tim: It’s all about the music – I think the stuff we did holds up well, and with the resurgence of what is now called “classic metal” the timing couldn’t be better! And no – we are not really planning a full on tour, just a bunch of the metal festivals – at least the ones that will have us, hahaha! Greg: We didn’t have the opportunity to play outside of southern California back in the day, so a lot of folks have been waiting 30+ years to see us live. Jimmy: I’m very excited for the band and to be part of this journey. The fans are the best, and I am blown away at the ranking position at these festivals. We just gotta stay healthy and motivated. Pat Riot: Back in the 80s when Cirith Ungol was playing the L.A. circuit, a scene dominated by many lighter fare ‘glam’ type bands, how was CU received at that time? Tim: We had a fan base back in the day, but really the LA scene for the most part had no idea what to make of us – especially that “singer” lol. We played all the clubs down there and met a lot of great people and bands that are still going strong today!! It was a strange time! Greg: CU didn’t really fit in with the hair metal scene. As you can imagine, there were people who dug it, and people who didn’t. After I left the band, I saw CU play at the Beverly Theatre with Ratt and Lita Ford. CU commanded the stage, and there were a couple of hundred fans (maybe 25% of the crowd) totally into it, but the other people had come to see Ratt or Lita and weren’t into it. Jimmy: I had only played a handful of local shows from ’87 – ’89 (LA, Ventura, Santa Barbara). It did seem that the crowds were a bit thin and only the die hards came out and stood in the front to pound their fists and head bang. I remember a mosh pit of punk rockers formed at one home town gig. That was entertaining. Pat Riot: Cirith Ungol released only four official albums in the span of a decade (’81-’91) but the band holds such an iconic place in fans hearts.. why do you believe that is? I have read many things over the years that seemed to indicate a reunion would be unlikely, ever, so what drove the band’s return? Tim: It’s all about the music I think. Those records hold up pretty well and I think they are good metal albums, and I guess there are a few people out there that feel the same way, hahaha! And yes, for a very long time a reunion was something that was never going to happen, for a lot of well documented reasons. I won’t go into that since that story is pretty well known. The main reasons it did happen is largely due to the efforts of Jarvis, his tales of seeing Ungol stuff all over the world while on tour with Night Demon. 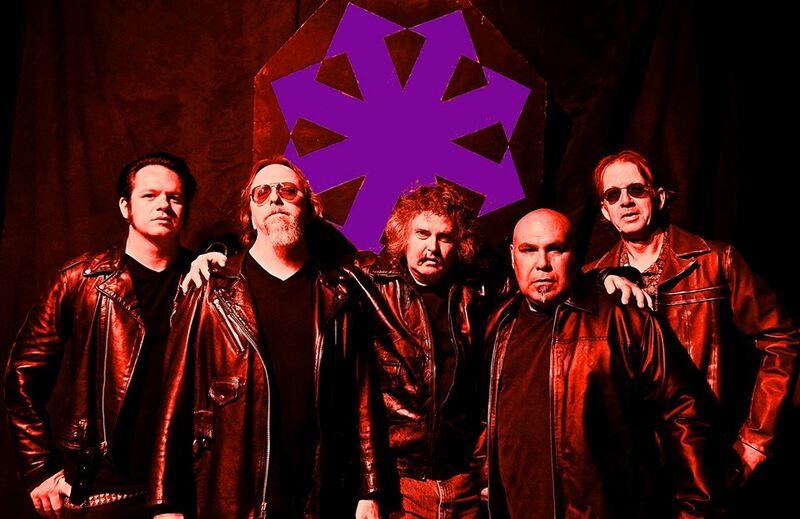 The creation of the Frost And Fire Festival, which was the first time in decades the surviving members of the band had all been together, even if it was just for a meet and greet. His support and perseverance to put us back together was something to behold hahaha!! 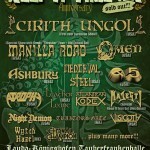 I must also thank Oliver [Weinsheimer] from the great Keep It True Festival. He had been asking us for years just to come over and enjoy his festival, and for years we politely said no. But Rob and I finally went over last year, and to see all the people with Ungol patches, albums to sign, and even people with Cirith Ungol tattoos!! It was a mind-blowing experience and it certainly helped me change my mind about playing again. To see things on the internet and know that there is still a bit of interest in the band is one thing, but to see it in person was amazing!! Greg: I think Rob needed something to do in his sunset years! And I figured we had better get together and play before: 1) people stop asking, and 2) we get too old to rock and roll! Jimmy: For years I had hoped for a reunion. Once the opportunity came up, I jumped on it. I am so elated to be playing once again. It’s all good. Rob: I think our listeners are not unlike our band members and are yearning for something more from their music, something that challenges, and engages them. Even though we wanted to be successful, we did not write the songs to appeal to anyone but ourselves, and I think people get that. I also think they have all succumbed to the “Legions of Chaos! I swore I would never play drums as long as I lived. At the “Frost & Fire I” festival Oliver Weinsheimer came from the “Keep It True Festival” and Jarvis got all the guys together for a meet and greet. They pretty much made us an offer we could not refuse. It was these two guys that will go down in history as the ones that unleashed the Fury of Ungol upon the world! Pat Riot: How does having Night Demon’s Jarvis Leatherby in the band help things? It looks like his presence would kind of ‘bridge the gap’ between older fans and the current scene’s younger ones or am I off-base with such an idea? Tim: I hadn’t looked at that way before but I suppose you might be on to something there! His main help was of course getting us back together, with management stuff, and besides being the hardest working man in Metal he is a great musician and a good friend, Night Demon and Cirith Ungol are like a family. Jarvis, Dustin [Squires], and Armand [Anthony] are really great guys and we are proud to know them! Greg: That’s a good point. I’m sure that Jarvis will bring along some Night Demon fans for the ride! Jimmy: Filling the slot of bassist was first offered to Flint, but he had other commitments and declined. It was only fitting that Jarvis being a fan of the band, a seasoned musician and has the drive to make Cirith Ungol great again and to take the roll of manager and bassist. It is my pleasure to play alongside Jarvis. His Energy and commitment has proven invaluable and vital to our success. Pat Riot: You all surely get this all the time but will/would/is Cirith Ungol entertaining the idea of recording new music or a new album? Tim: Yes. We would hope to do a new record sometime in the future and are actively writing new stuff as we speak-along with getting ready to hit the festival scene! Greg: We are working on new songs and unearthing a few unheard old tunes with that in mind. Rob: Tim has written some great lyrics and we have a few songs in progress. My goal is for the next album to be like “King Of The Dead”, something we will be proud of! Just for the record Metal Blade Records is re-releasing a deluxe edition “King Of The Dead” in vinyl and CD with full color booklets, colored vinyl, and a DVD of a rare show we played at the Roxy, in Hollywood that no one has ever seen before! It also has several live tracks from our appearance at “Frost & Fire II”. They did such a great job on “Paradise Lost”, and we are all looking forward to this re-release. Everyone that is a fan of the band should get this one, as it is our best album to date and they are finally doing it justice! 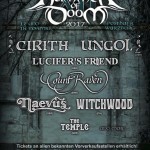 Pat Riot: David Paul Seymour is one of my absolute favorite artists..are you all excited about ‘The Planet Of DOOM’ cinematic project and the inclusion of Cirith Ungol music in it? Speaking of artists, any specific reason that the works of Michael Whelan have exclusively been used on CU album’s artwork? 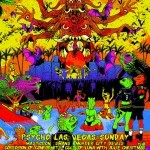 Tim: His paintings are the absolute best album covers ever done by anyone-period. We are so honored to have him on our side, he is such a great artist and also such a very nice guy!! Just recently went to a gallery opening of his here in California. It was so special to reconnect with him after many years. And he had the original painting of Stormbringer at the show, the Frost And Fire album cover…to actually see it up close and in person was something I will never forget, just awe inspiring. And the Planet Of Doom project looks like it will be so badass, I cannot wait to see the final results!! Greg: Back in the day, we had originally envisioned using a painting called “Death Dealer” by Frank Frazetta, who is famous for many Conan illustrations. One day I walked into a record store and there it was on the cover of a Molly Hatchet album! Anyway, Rob and I were both reading Michael Moorcock’s, Elric series at the time, and the U.S. editions all had Michael Whalen’s paintings on the covers. Rob got in contact with Michael, who is one of the nicest guys we’ve ever met, and he agreed to let us use “Stormbringer”. He liked the music and felt that it was an appropriate match for his artwork, and we were totally thrilled and honored to be able to use his artwork on our albums. For sure it has helped us to sell more albums. I even know some people who don’t care much for our music, but buy the albums just for the cover art! Rob: We are hoping that any new project will feature another of Michael Whelan’s Elric illustrations! I feel very privileged that we were allowed to use 4 of his masterpieces on our albums; they would not have been the same without him! “Planet Of Doom” is going to be an awesome project and we are very excited about this also!!! 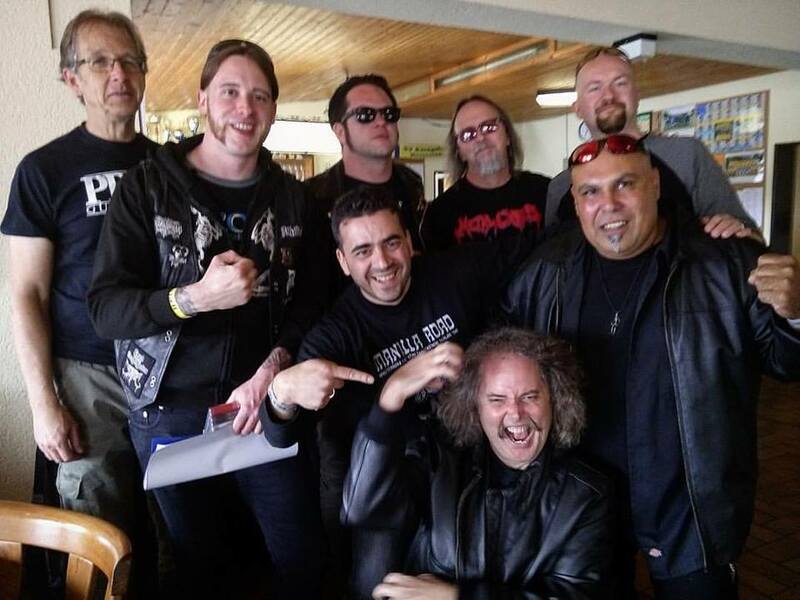 Pat Riot: How did Cirith Ungol’s involvement with Metal Blade come about and is it safe to say the band is pleased with the re-issues they’ve provided? Are there any plans to give the ‘Paradise Lost’ record the same treatment? Tim: The reissues have been great. And of course by the time you read this the Paradise Lost one will already be out!! The KOTD ultimate edition is set for release to coincide with our first ever European appearance at the Keep It True festival in April and it is going to be killer!! Greg: MB has done a great job with the reissues so far, and the new KOTD reissue is going to be fantastic. Jimmy: I’m very pleased with the reissue of Paradise Lost in October 2016. It’s also cool to hear some alternate track mixes on the CD. Bart Gabriel did a great job re-mastering, and Metal Blade also gave their all in regards to the vinyl and packaging. Rob: Brian and everyone at Metal Blade Records have been instrumental in the band’s career over the years. We met Brian when we were first thinking about “Frost & Fire”. He worked at a record store in the LA area and was and still is a good friend. He was launching his record company at the same time, and he hooked us up with the company that would distribute our first 2 albums, Greenworld Distribution. Metal Blade Records in Germany have spearheaded some amazing projects, such as “Servants Of Chaos”, and the deluxe editions recently, and we are proud to be their friends. We were pretty surprised when Brian was asked to name his favorite releases over the history of his label, and he picked “Metal Massacre 1”, which one of our songs, “Death Of The Sun” was on, and “King Of The Dead” as 2 of his top 11 releases of all time!! WOW! Pat Riot: After nearly 50 years in the musical realm, what is one of your most cherished memories from it i.e. an experience or event, meeting someone, etc. whatever it may be? Tim: Well for me it is probably making the records we made, and for sure the recent reunion, something that for decades was never going to happen. To be able to finally go out and play around the world is like a dream come true for us. Greg: Feeling like a proud father, holding a brand new shrink wrapped copy of Frost & Fire fresh from the pressing plant back in 1981. Your first album is always special! Jimmy: I’ve had the privilege of spending the day with Grace Slick shooting an MTV Video, visited back stage with Carlos Santana (he bogart’s, ha-ha), and even randomly ran into Ozzy Ozbourne here in town (he was 1/2 brain dead, ha-ha). Or I should say that he ran into me. Literally. It was at a Mexican restaurant, he was eating then heading straight to rehab. And of course it has been awesome to play in a band that is finally getting some well-deserved recognition. Rob: The proudest moment for me was taking the stage as the headlining act at “Frost & Fire II”! Playing on my beautiful Ferrari red DW oak drum set, surrounded by the most amazing set of Paiste cymbals and gong, and beating the drums. Having all that firepower at my command I felt like a metal god for one small moment in time! Tim: I would like to say a huge thank you to all the people that encouraged and supported Ungol all these years – without you the band would be in the dustbin of history, and we certainly would have never gotten back together!! I look forward to telling you all “thank you” in person. Greg: Huge thanks to everyone who has supported CU over the years. We really appreciate it! Jimmy: To all the Fans. Your enthusiasm is much appreciated. Thanks for keeping the torch lit and making us feel like Metal Gods. Cheers! Rob: I would ask anyone that can make it, to come to one of our rare shows. If you like the band, or our music, I promise you will not be disappointed!!! Everything in my life has culminated in this reunion and I want to share it with everyone! This is Cirith Ungol..what am I going to say after this that’s going to add anything to what has just unfolded here? Nothing. So with that, I want to thank our guests, the magnificent Cirith Ungol circa 2017: Tim Baker, Greg Lindstrom, Jimmy Barraza, Robert Garven and Jarvis Leatherby who was here in spirit. Metal Is Forever!! !